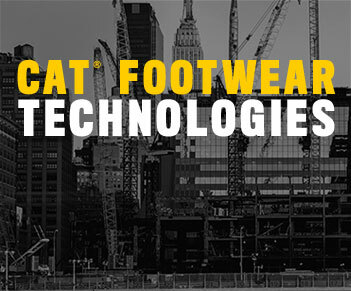 At Cat Footwear the spirit of hard work is not lost on us. 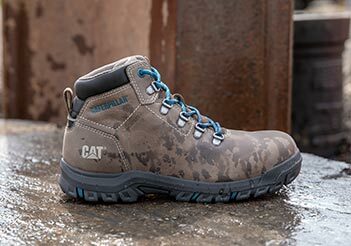 We’ve spent decades helping people who go the extra mile, who grab life by the laces and never let go. We want to continue to champion all workers, including those who are found on construction sites, oil rigs, and in tough environments. But your day doesn’t stop the moment you clock out. Maybe you don’t clock out at all. Your work site might vary from coffee shop to wind farm to office space and your interests might range even further. 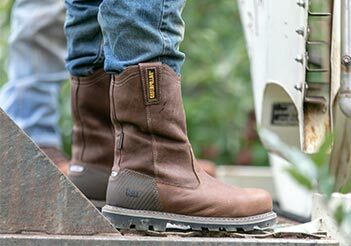 Wherever your “work” site may be, a typical work day has shifted from nine-to-five and with it, what you ask of your work shoes. 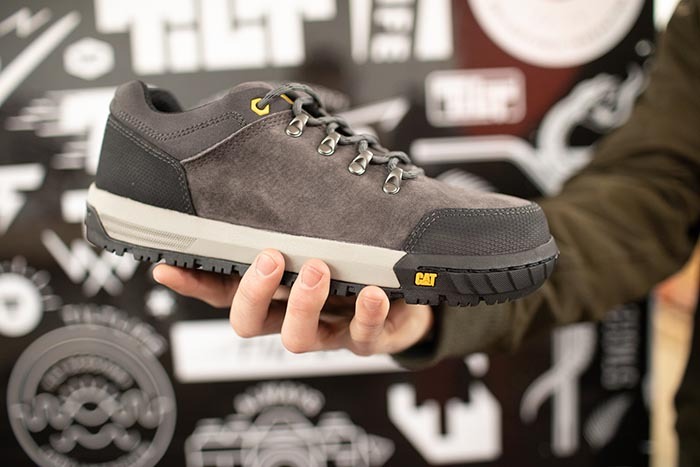 Introducing the CONVERGE, a skate-inspired work shoe for the guy who doesn’t want the everyday brown boot. 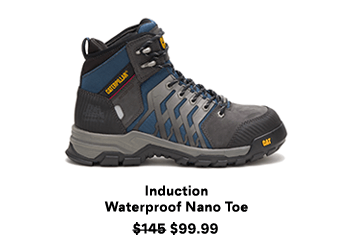 Built with the flexibility and streamlined aesthetic you would expect from an athletic shoe, combined with the high-grade slip resistance and durability your job demands. 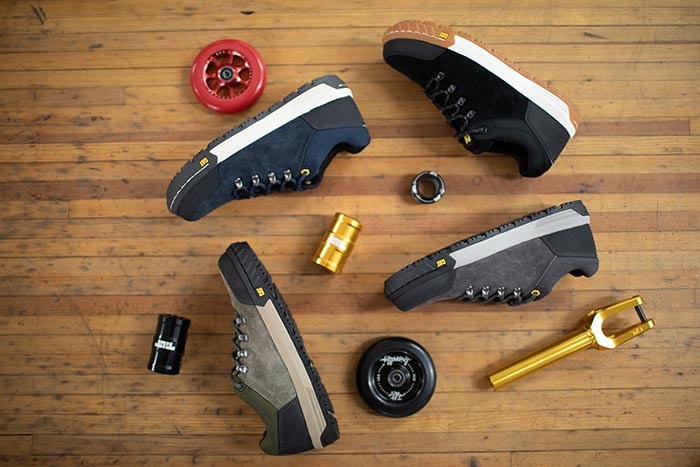 Featuring the employees at Tilt, a company that manufactures scooter parts to help riders re-enforce their scooters to ride better, stronger, longer, and have more fun doing it, the Converge is a shoe that inspires many types of work, no matter what that might mean for you. 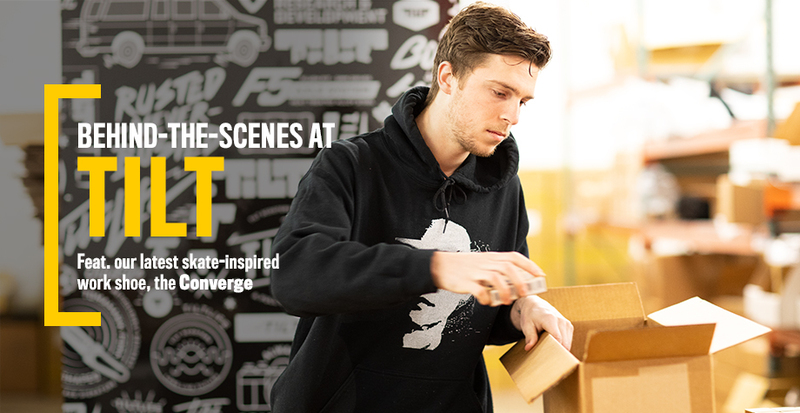 We discovered the founders of Tilt on accident, stumbling upon their warehouse space during a local photoshoot. 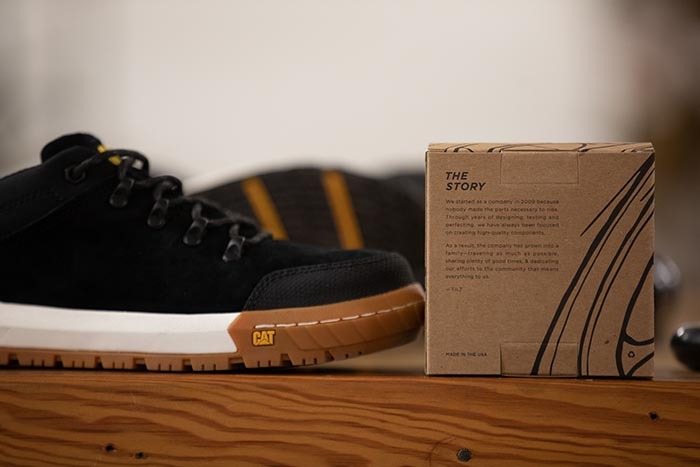 Chatting with founder Collin Snoek, we were inspired by his story of building the Tilt brand from the ground up, and his can-do attitude, which is exactly what we support at Cat Footwear. 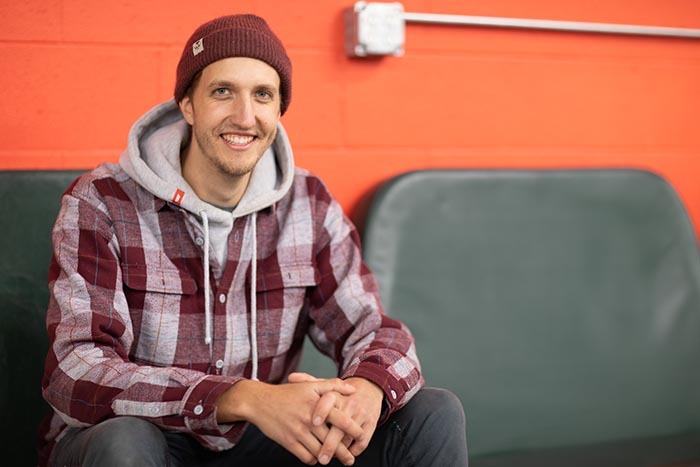 We met with him and his co-workers/friends to talk about growing Tilt, what it takes to continue to move forward with a progressive attitude, and a behind-the-scenes look at what it means to start your own business. See below for our interview with Colin and to learn more about Tilt. What compelled you to start this company? I was pretty much a hermit growing up with only a couple close friends. I spent most of my time in the garage working on anything with wheels. I broke my bike and picked up a scooter. Scootering came along with this great community that welcomed me. 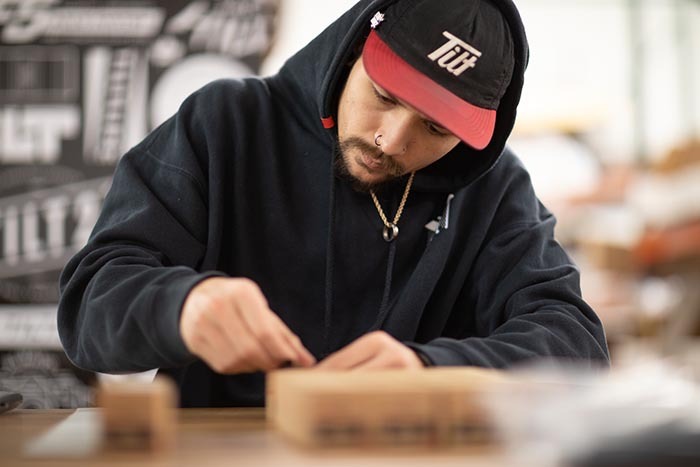 I had the opportunity to create products and friendships. That’s pretty much my ideal. What does the scooter community mean to you? If you take the scooter community out of my life, I don’t really have a story. I guess that’s what the scooter community means to me. What do you think contributes to the following you have been able to build around Tilt? 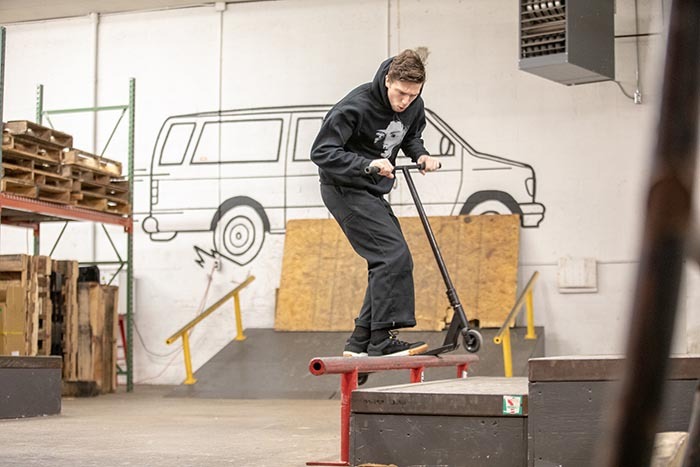 Tilt has a unique sense of quality and attention to detail within scootering. There’s not really anything else like it, and we have a really great group of people who have aligned themselves with Tilt and pushed forward. I don’t really like taking credit for the brand loyalty since so many people have been involved. What does progress and success look like for you? Progress is eternal. Nothing is perfect, and nothing ever will be perfect. Progress is accepting and moving forward. I was so horrible at practicing this mindset until quite recently. Success is a tricky one. I’ve always appeared successful to people, but I’ve never considered myself successful. The cliche definitions of success such as money don’t bring the feeling of success. I think to feel success is to have appreciation. When I find appreciation for everything in my life, I’ll feel successful. I’ll let you know if I ever figure it out. I bet it’d feel good, haha! I have been enjoying my family and friends lately. It’s awesome. Besides that, building anything with wheels, snowboarding, camping, and traveling to other cultures. All of those things are humbling because once you get too much confidence, something goes wrong. I haven’t traveled with Tilt much in the past year, but I’m planning to be gone once per month in 2019. It’s going to be fun! What’s the most important part in the creation process? The most important part during the design process is constructive criticism within the team. The most fun part is finally being able to see riders get stoked on whatever we created. What’s your favorite part about creating your company/working for yourself? What’s your least favorite part? I absolutely love being able to employ and work with others. They have made my life what it is. That said, I absolutely hate making hard decisions for the future of Tilt such as laying someone off. It breaks me. What advice would you give people looking to start their own business, or something they aren’t sure is going to work? I’d recommend keeping both emotional and financial liabilities within reason. Chances are if you’re starting your own business, you’re passionate about your idea. Few things are worse than having the joy of your endeavor taken away by the stress of financial liabilities and the stress of having too much of yourself emotionally invested. Emotional and financial balance is key in order to stay positive.